Team BitWise from VNIT had participated in the 3rd edition of the Smart India Hackathon 2019 software edition organised by MHRD, AICTE,MIC,Persistent,I4C and Rambhau Mhalgi Prabodhini. 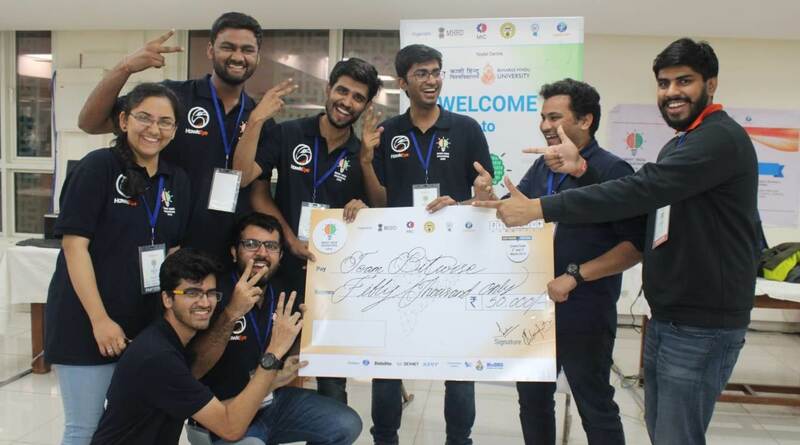 The Team comprised of : Chaitya Chheda(Team Leader) ,Deval Mudia , Ritwik Deshpande, Kapeel Suryavanshi, Ayush Singh, Shalaka Patankar all from BTech 3rd year Computer Science and Engineering. For the first round 168 teams had submitted their idea out of which only 4 teams were selected for the grand finale that was held in BHU Varanasi for the problem statement provided by MixORG. The problem statement involved developing an affordable mobile application to monitor entry and exit of vehicles in a residential society. The grand finale involved a 36 hours hackathon which consisted of 3 rounds of evaluations by mentors and industry professionals. The team came first and was awarded a cash prize of Rs 50,000. They were felicitated by professor Rajive Kumar(Committee member AICTE), Professor Neeraj Tripathi (Registrar BHU), Dr Nitin Bhide(AICTE BHU Co-ordinator) ,Kavita Shah(Convener SIH 2019,BHU).